When everything from health care, to air tickets to money management services to applying and completing international courses, is going online, how can career choice be far behind. The days when you would give a cumbersome decades old aptitude test and rely on a career counselor to help you interpret the scores are gone. Now a days you have online career aptitude tests that are reliable and valid and capable of helping you select the right careers for you. 1. You are still in school and are looking for the best stream and subject combination, so that it takes you to your dream career and also keep your options open ( in case of any eventuality): Career Aptitude Test can help you by providing ranking for that various streams in class 11th. 2. You are confused about what to do after 12th: A career aptitude test can help you find the right course that matches with your Aptitude and Personality profile. 3. You have done your graduation ( Or are still in 1st or 2nd year) but have figured out that you did not make the right choice: A career aptitude test can help you change and put you on the right career path. And like that career aptitude test can help you plan your career better. 1. 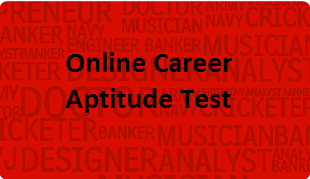 Online career aptitude test offers all advantages of career aptitude test and an added advantage of getting all these in the comfort of your home or at your place. 2. It saves precious time, money and efforts. 3. You can get the services of the best Career Counselor without any location disadvantage. 4. If you get easily distracted and are not comfortable in a group setting ( like an aptitude test conducted at school), Online career aptitude test is probably the best for you. To get the maximum benefits out of a career aptitude test one should ascertain that the test that one is taking is valid and reliable and must confirm who the people behind the development of the test are. Scoring of a psychometric test is a specialist job. Either you should take the help of Career Counselor or should choose a test where the scoring is inbuilt in it right at the time of designing the test. Like In Mapmytalent test the scoring is inbuilt and you can see the scores after completing the test. Later you can take the help of a career counselor to help you use these scores to make the right career choice. Good Psychometric tests are designed in such a manner that you have take them once only. We have seen that many students take 3-4 tests that are available freely and get even more confused. It is better to take one test that is valid and reliable and then plan the career. In case you get stuck in your career path, you can go back to the report and take help of career counselor. Choose the best suited career/ course as per your INHERENT STRENGTHS!